A retrospective review here, requested from the label and comprising of two tracks spanning just over 22 minutes in length. Gutter level vocals, sludge driven guitars and precise rhythmic percussion are the main foundations of opener ‘Asleep and Threatening’. 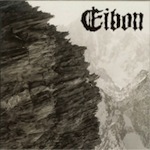 With a spotless production, providing an edge that could have been lost somewhat as so many of this ilk suffer from, Eibon manage to drive home a barrage of brutality whilst keeping check on harmony and clarity of structure. ‘Staring at the Abyss’, carries on from where track one left off, albeit in a slower fashion, focussing more on breathing spaces for an unnerving psychosis to slide through the gaps, before bludgeoning the listener to death. Think of mid period Black Sabbath tinged with slower elements of Eyehategod and you will be somewhat close. Concentrating your efforts on producing lengthy tracks can be a dangerous game, where it’s ever so easy to become self-indulgent and bore the listener senseless. Eibon however, have variation on their side and an attention to finer detail, providing what is overall, a solid interpretation of the genre with hints of better things to come. I haven’t heard anything else by this project, but if this EP is anything to go by then I wouldn’t be surprised if this has already been achieved on future releases.